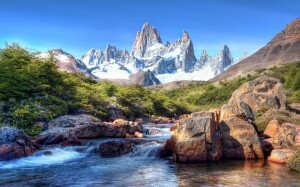 A land of outstanding natural wonders, Argentina is definitely one of the world’s hottest bespoke holiday destinations. From the Tropic of Capricorn to the tip of Antarctica, Argentina offers incredible diversity. From the Litoral wetlands to the bone-dry Andean plateaux and onto the archipelago of Tierra del Fuego, Argentina has all the ingredients of a holiday of a lifetime. Perhaps you would like to visit the verdant flatlands of the Pampas and the dramatic steppe of Patagonia? We can help put together the itinerary for your bespoke holiday. With the exoticism of South America and its powerful European influence, Argentina is the most European of all American countries, with a very special character all of its own. Argentine society is dominated by football, politics and living life in the fast lane. Not everyone dances the tango or gallops around on horses, but wherever you are, you’ll be wowed by Argentina’s zeal for their own culture. Buenos Aires has to be the most interesting of south American capital cities. Wander around and people-watch, shop, or just soak up the atmosphere. Decadent and old-fashioned meets daring and modern in the city’s architecture. Other Argentine cities worth visiting are Salta in the Northwest, Rosario which is the birthplace of Che Guevara and Ushuaia, the world’s most southerly city. But the country’s most impressive facet has to be the wild landscape land the wildlife inhabiting it. By hopping on a plane or two you can go from howler monkeys and toucans in northern jungles, then watch penguins sliding into the icy South Atlantic a few hours away. Hundreds of bird species attract birders from all over the World including the Andean condor and three varieties of flamingo. Also, if you;re lucky, you might get to spot pumas, armadillos, llamas, foxes and tapirs in the forests and mountains. And that’s just a taster. To find out how we can put together the Argentine holiday of a lifetime, give the team at Howards Way a call on 0161 766 7000.